Bergdahl Associates supplies a revolutionary tool for anyone using sealants, mastics and silicone bonding compounds. Sealant Removal Wipes are a unique non-woven fabric impregnated with a non-toxic aqueous solution. They safely remove uncured or partly-cured adhesive and sealant by breaking the surface tension between the material and the substrate. The material then transfers to the wipe for disposal. Sealant Removal Wipes are packed in quantities of 150 wipes in a convenient resealable tub. If you always felt there must be a better way of cleaning up, you were correct and now you can have it with our sealant removal wipes. No solvents, no abrasives, no fuss and no mess! Anyone applying sealants, adhesives or mastics can improve their operation using Sealant Wipes. – Uses Wipes to clean up after applying sealant to fuel tanks, access doors or windshields or any other location on the aircraft that sealants are used. 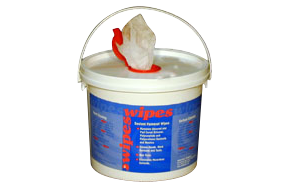 – Uses Wipes to clean up after applying adhesives in the construction of fiberglass and SMC watercraft. – Uses Wipes to clean off any excess caulking or sealant from windows and windshields. – Uses Wipes to remove excess uncured adhesives or sealants in manufacturing and assembly processes. Take Advantage of a great “wipertunity” to improve your sealant cleanup process.